Feel free to drop a line and let us know what you would like to see here. Michael (Cowboy) Russell is your Webmaster here, and if any of you have historical pictures to incorporate on this site, please send them. If you email Mike, he will send you a mailing address. His email is located at the logo below. a Merrill boy, unidentified, Toby Hedges, and unidentified. Nettie Redding Little and Mary L. Burns. a Merrill boy and the last man is unidentified. We are really looking forward to put these two sites together for our upcoming conventions. If you can help in anyway please send us an email and help us organize these events, like, places you might want to see, restaurants of interest and maybe your favorite hotel for the location. 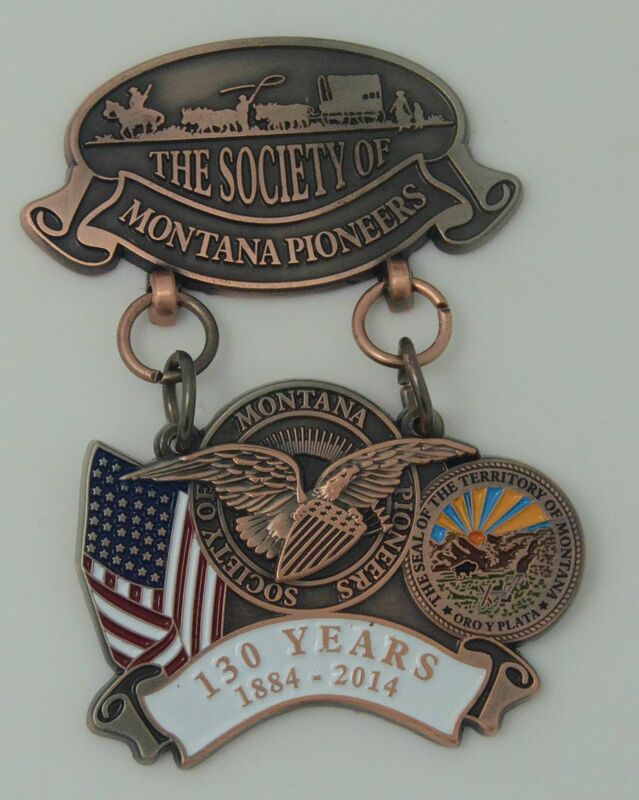 As can be seen on the pin mock-up above, the oval top (magnet attachment) has the Sons and Daughters Logo with the wording “The Society of Montana Pioneers” (antiqued copper). The linked charm has three parts: The left is the 38 star U. S. flag of 1884 (in color), the middle circle is the Society of Montana Pioneers Seal with an eagle holding a shield (antiqued copper), and the right circle is The Seal of The Territory of Montana that was in use in 1884 (in color). The Montana Historical Society and the Montana Secretary of State’s offices graciously gave us permission to use The Seal of The Territory of Montana. The wording on the white ribbon: “130 Years 1884 – 2014”. The price of the pin is $20.00. Anniversary Pin Order Form above (click on Anniversary Pin). The cost for mailed pins will be $25.00 each ($20 for the pin and $5.00 for shipping and handling). Don’t miss the opportunity to own one of these limited-edition, one-of-a-kind pins for you and your family members. 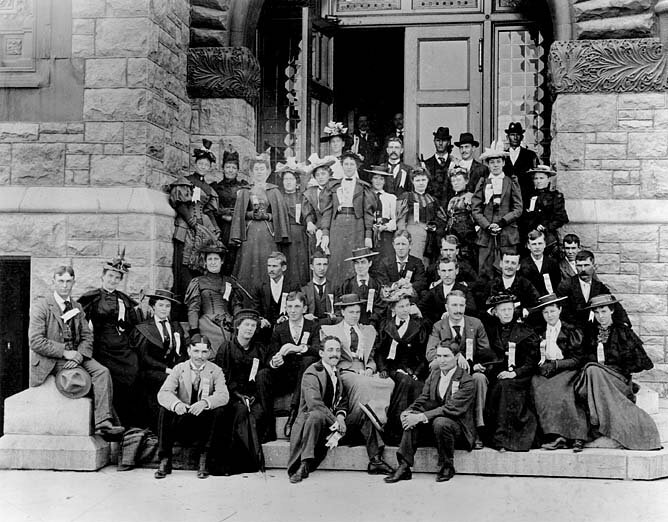 James has established along with the University of Montana Western a "HISTORY EDUCATION SCHOLARSHIP" This Scholarship is only available at the UMW to all qualified and enrolled SENIOR History Majors planning a career in teaching history or GRADUATE Students already employed in History Education. We will be awarding our first scholarship for the academic year of 2016-2017, and we welcome all eligible students to apply before January 2, 2016. Applicants will be evaluated on foinancial need, community, school, and church activities, grade point average (4.0-2.49), and (but not required) military service, and a SDMP member. You may not have participated in all of the above activities, but dont hesitate to apply for our scholarship. or check out this website below for an application. on this link and supply us with your email address and we will update our records. our members informed of important updates. Have a great day. Thanks for sending us your emails to update and improve the distribution of messages and newsletters to you. This in turn saves the organization lots of money. Please click on the appropriate link below. In order for this link to work you must already have a Pay Pal Account. We are now making available video's and slide show presentations that were made during the 1942 thru 1963 Conventions, slide show DVD's range from 1965 thru 1973, also, Video's of 1987, 2000, 2001, TV coverage of 2001 Book Signing and 2010 video titled "Montana Poor Farm". guestbook, please email us with your questions and we will get them answered that way.